Every once in a while, you see an effect that is so astounding that you just can't get it out of your head. "Reshuffled" is, for us, that kind of trick. We saw it at the home of Juan Tamariz, when Pedro Morillo, his close friend, was asked to "do the thing." This "thing" was so stunning, so memorable, that we never forgot it. In fact, we pursued releasing it, and that day is here. It's quite easy to visualize. It is, mostly, Paul Gertner's wonderful, classic, and perfect effect, "Unshuffled" (which in turn is based on a Michael S. Ewer trick). But the new ending takes this amazing trick to soaring new heights. You display a deck with strange markings on the edges. A card is selected in the freest possible manner, and then, through a series of shuffles, the markings on the edges of the cards align to spell the word "Unshuffled." It is as if you are unshuffling the deck of cards. True to form, every card in the deck is now shown to BE IN ORDER. You really have unshuffled the deck. Then, you cause the markings on the side of the card to visually rearrange themselves to spell the name of the selection. That is the fabulous "Unshuffled" routine, and where it ended originally. In this version, you spread the deck one last time to show that now EVERY CARD IN THE DECK HAS CHANGED INTO THE SELECTION. Some things to consider: we love this routine because carrying "Unshuffled" always necessitated carrying a deck devoted to just this trick. So, why not add some special features into the deck that will allow you to force the card in the freest possible manner, and end with an all-as-one ending? Now you can. The faro shuffle is usually required to perform "Reshuffled," and that is how we perform it. However, a non-faro, totally self-working method is also included, created by Maestro Juan Tamariz. 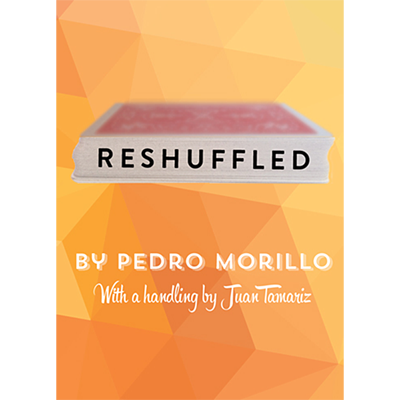 You receive the special "Reshuffled" deck and a complete video tutorial with instructions on every phase of the routine, including Juan Tamariz's non-faro handling. "Killer Ending! I can't wait to try Reshuffled on my clients"
"Pedro's effect is the best handling of Paul Gertner's classic and so clean it would fool anyone."